It’s hard to set your emotions aside when you’re faced with a difficult decision. This is problematic, since our emotions often cause us to make the wrong decision in important areas of life, including in our relationships, our finances, and our health. In general, most people find that setting these emotions aside can be rather difficult when it comes time to make a decision. However, by using a few simple self-distancing techniques, you can significantly reduce the impact of these emotions, in a way that will enable you to make better decisions. In the following article, you will learn more about the concept of self-distancing, understand why it’s beneficial, and see what you can do in order to implement self-distancing techniques in situations where you need them. Self-distancing is the act of increasing the distance from your own egocentric perspective when assessing events and emotions that you experience. As such, a self-distanced perspective is an external perspective that you can use when thinking about an event that you’ve experienced, where the self who is analyzing the event is considered to be distinct from the self who experienced it. For example, a self-distanced perspective is the perspective that you use when you ask yourself “why did you just do that?”. This is contrasted with a self-immersed perspective, which is an internal perspective that you can also use when thinking about an event that you’ve experienced, where the self who is analyzing the event is considered to be identical to the self who experienced it. For example, a self-immersed perspective is the perspective that you use when you ask yourself “why did I just do that?”. — Basketball player LeBron James describing his decision to leave his old team. A good example of how people can use self-distancing appears in a study that examined people’s self-talk mechanism, which is a form of intrapersonal communication that people use when they think (i.e. their inner monologue). The researchers’ starting point was that you can promote self-distance during times of introspection, by using the second-person pronoun (“you”) or by using your own name (e.g. “John”) when thinking about yourself, instead of using the first-person pronoun (“I”). This concept is based on construal level theory, which suggests that creating psychological distance in one domain can promote psychological distance in other domains, so that increasing people’s psychological distance from a certain event by changing their linguistic self-distance could affect how close they feel to that event from an emotional perspective. Participants in the first group were instructed to think about themselves in the first person. This means, for example, that participants in this group would ask themselves “why did I feel this way?”. Participants in the second group were instructed to think about themselves using second-person pronouns or using their own name. This means, for example, that participants in this group would ask themselves “why did you feel this way?” or “why did Jane feel this way?”. The researchers then measured participants’ self-distance during their recollection of their past experiences. 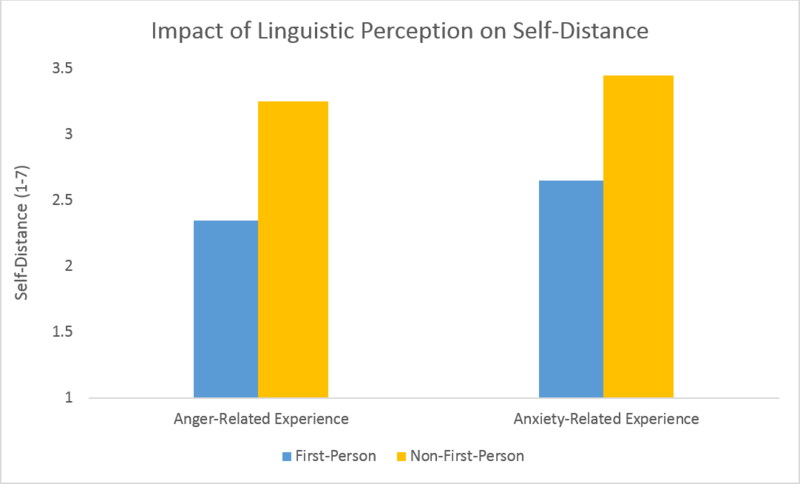 What they found was that the simple change in perception allowed participants to increase their emotional self-distance when considering these events, as we see in the figure below. Data is from: “Self-talk as a regulatory mechanism: How you do it matters“. Essentially, when people referred to themselves in the second-person or using their own name, they were able to improve their ability to detach emotionally from the situation. This improvement is important, because increasing emotional self-distance has been shown to have several important benefits, as we will see in the next section. Research has shown that using self-distancing techniques can be beneficial in several ways. First, as we saw in the example above, self-distancing can help people cope with difficult events from their past. This is in line with other research on the topic, which shows that self-distancing can decrease the duration of negative emotions and help reduce aggressive thoughts and angry feelings. Furthermore, self-distancing can also help people deal with socially distressful situations, even when those people are naturally prone to social anxiety. Part of this is attributed to the fact self-distancing encourages people to engage in adaptive self-reflection, which allows them to handle difficult emotions in a positive manner. This is contrasted with using a self-immersed perspective, which often leads to maladaptive self-reflection, which involves, for example, the tendency to obsessively ruminate over past events. Another advantage of using self-distancing is related to people’s wise reasoning, which is the ability to do things such as recognize the limits of your knowledge and remember the importance of being willing to compromise. Specifically, people tend to display high levels of wise reasoning when they give advice to others, but not when they decide how to act themselves. However, when people use self-distancing techniques, by asking themselves what kind of advice they would give to a friend if they were in the same situation, people are able to reduce this asymmetry in their insights, and apply the same reasoning skills to their own dilemmas as they would to those of others. Finally, increasing self-distance also has direct benefits when it comes to improving people’s decision-making ability, since self-distancing has been shown to reduce decisional biases under a variety of conditions, and to improve decision-making during times of information overload. Overall, research shows that smart implementation of self-distancing techniques has numerous benefits. These include, among others, an improved ability to cope with negative emotions, an improved ability to cope with stressful situations, and an improved ability to make rational decisions. There are various techniques that you can use in order to increase your psychological self-distance. First, as we saw earlier, you can use self-distancing langauge, by referring to yourself in the second or third-person in your internal monologue. For example, this means that when faced with a difficult decision, instead of asking yourself “why am I worried about this?” you should ask yourself “why are you worried about this?”. You can also increase your self-distance by trying to view the situation from an alternative viewpoint, that is different from your own. For example, if you got into a fight with someone, you could try to consider what the fight looked like not only from your own perspective, but also from the perspective of the other person, or from the perspective of an external observer. Furthermore, in some cases, when deciding what to do, you can also try to visualize the perspective of an exemplar, which is someone you admire, and then ask yourself what would they do in that situation. Finally, you can also create self-distance through other methods, such as expressive writing, which involves writing about your thoughts and feelings when you’re trying to analyze an event that you’ve experienced. Overall, there are many techniques that you can use to increase your self-distance, in order to help yourself make more rational decisions. The two most notable techniques for this involve using self-distancing language in your inner monologue, or visualizing other people’s perspective when analyzing events that you’ve experienced. 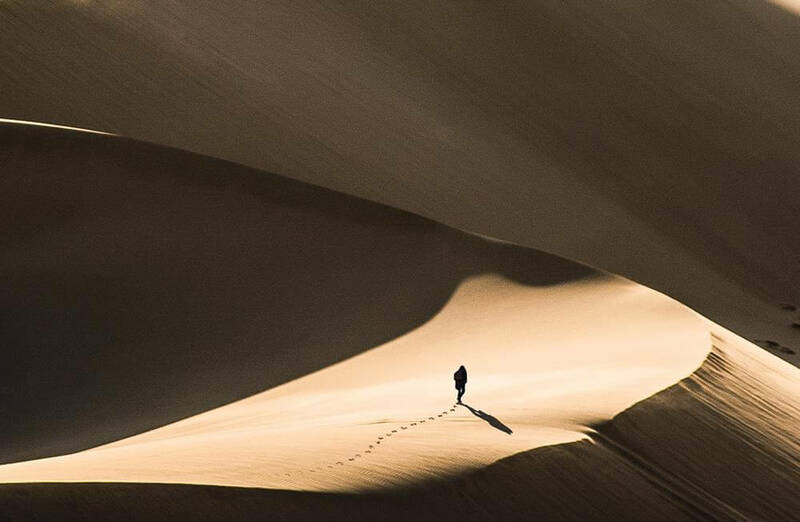 Self-distancing involves increasing the psychological distance from your own self-centered perspective when assessing events that you experience. Self-distancing allows you to detach yourself from emotional situations, which can help you cope with negative emotions, such as stress and anger. Self-distancing can also help you to make more rational decisions, and encourage you to use effective reasoning skills when deciding how to act. You can create self-distance by modifying the language that you use during times of introspection, and specifically by referring to yourself in the second or third-person (e.g. “what should you do?” or “what should John do?”) instead of using the first-person pronoun (e.g. “what should I do?”). You can also create self-distance by considering events from an external perspective that is different than your own, such as the perspective of a person that you were talking to, or the perspective of an external observer who watched an interaction that you were involved in.